Gunthorpe Harriers Under 16s are pictured before their 2-0 win against Thorpe Wood. They are from the left, back, Lucas Rall, Tyler Nightingale, Liam Roberts, Matthew Wilshire, James Ware, Sam Bloodworth, Finlay Richmond, front, Oliver Baig, Brooklin Gray, Bradley Nicholls, Tyrese Brown, Alesio Hoxha and Tyler Munns. Peterborough Sports are not just flying high in senior football - their two youth teams are having a cracking season as well. The Under 15s, who were the all-conquering Wasps Under 14s side last season, are sitting pretty at the top of the Peterborough Youth League Division One table with a perfect record of eight wins from eight games. Thorpe Wood Rangers Under 16s are pictured before their 2-0 defeat by Gunthorpe. 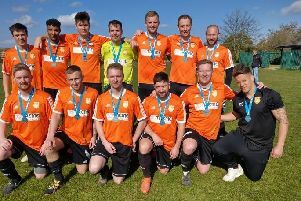 From the left are, back, Chris Fenton, Keith Barsby, Scott Stojanovic, Jamie Morris, Filip Czerwonka, Blazej Chabraszewski, Patryk Huczko, Oliver Blood, Sam Fenton, Lee Barsby, front, Ethan Bennett, Ibrahim Sankare, Ethan O'Hanlon, Tyler Rooke, Ged O'Sullivan. Reegan Martin, Riaz Hansraj and Lewis Hardy. They took great delight on Sunday in claiming the scalp of their big city rivals Northner Star 3-2. Tychique Muendo, Bradley Gilbert and Nasir Nabi were their players on target with Alex Roe and Fabiano Scolari scoring for Star. Glinton & Northborough Amber, the team in second place, dropped points when being held to a 3-3 draw by Blackstones. That means Sports have an eight-point lead at the top. Sports Under 18s are also doing well this season. They’re third in the Division Two table but very much in the thick of the title race. Action from the game between Thorpe Wood Under 16s and Gunthorpe Harriers. On Sunday they hammered Hungate Rovers 10-1 with goals by Calum Cooke (2), Dylan Kilford (2), Roman Paterson (2), Robert Pearson (2), Liam O’Connor and Joshua Hall. Under 18 Division Three leaders March Soccer School beat Thurlby 10-0 with Kyle Bird and Stefano Cavozzi both blasting trebles.